Who knew? 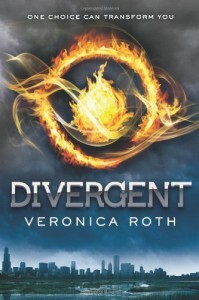 I liked Divergent more than I had figured I would, based on the impression I'd gotten from reading earlier reviews. It seemed like people were either commenting, "wow, this book is crap," or they were saying, "wow, best book I've read this year!" I don't think my opinion fell so drastically on either side, but surprisingly, I fell stronger on the "like" side than I had expected to.If you've read any of my reviews on dystopia books, you'll understand how I feel when I get stuck with books in this genre which have very little going on (I've read a few this past year which have bored me to tears). Less talky-talky, more fighty-fighty please. At least with Divergent, there was always something happening. We even got to see a taste of war in the very first book. A few comments from friends had me scared to pick up the book and I might not have if a buddy read hadn't been the push to get me reading. It wasn't nearly as sappy on the romance end as earlier impressions had lead me to believe. If anything, the romance was sort of in the background until closer to the end of the book and even then, it wasn't constantly in-your-face. If that was enough to scare people off, I'm a bit worried about people's fears of romance. I've read far sappier and far moon-ier (is that a word?) books. Yes, I know that people are tired of scenarios where the girl is plain and the guy is hot, but I had a lot of respect when it came to Four (Tobias) and why he fell for Tris. Hell, he even admitted she wasn't pretty (which made me grin a little).Don't pretend," I say. "You know I'm not. I'm not ugly, but I am certainly not pretty.""Fine. You're not pretty. So?" He kisses my cheek. "I like how you look. You're deadly smart. You're brave. And even though you found out about..." His voice softens. "You aren't giving me that look like I'm a kicked puppy or something. "I don't think I'll go back and check out any post-read reviews for the book now. I had fun while reading the book (big thumbs up for a fast-moving plot, this doesn't happen as much as I'd like for the genre) and don't really want to start thinking of reasons why all of a sudden I shouldn't like the book, which can happen if I find things that people point out after the fact. Might as well not ruin my good experience. Even though the faction ideas were a bit undefined, I found myself not caring because I was caught up in what was going on. I found myself wondering which faction I would choose and went with Amity because it seemed the easiest one to deal with. Not that I'd want to have to be nice all of the time, but I could fake it to have a semi-normal life with them. The rest of the factions all sort of went cuckoo for cocoa puffs. Erudite might have been okay had they not started to crave power. It was hard to believe that people would allow themselves to be boxed into one faction, only clinging to one type of behavior. People are just not wired like that. In reality, we would all be Divergent (multi-faceted/multi-factioned). This was a bit of a tough pill to swallow, but again, the story itself was interesting to see how people were pushed into boxes and forced to conform. The fear simulations were fun to read about. The way they were described had me wondering what I'd be stuck with if I was placed in such a simulation. Then I started internally panicking at the thought of being stuck in a box or something. Note to self : don't imagine too hard!Final thoughts : Fun read, a bit hazy on details but not enough of a complaint to make me dislike the book. I'm looking forward to book 2.